There are a lot of good things going on in the blog world, lately. I know I've been a little absent from posting, but I wanted to catch you up on a few things. On Saturday, I met up with Jason from CookTrainEatRace, his wife, Karen and our good friend, Carla at Nutrition Addiction in Grapevine, Texas and participated in the Run For Sherry Arnold. This Virtual run was a true testament to the power of social media and what the running community is able to accomplish. 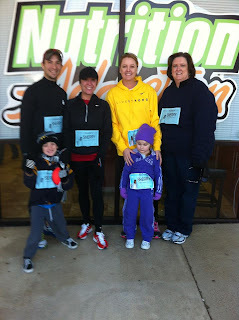 Organized by Sherry's cousin, Beth at ShutUpandRun, more than 20,000 race bibs were downloaded and countless more runners participated all over the United States and in different countries. She put up a very touching video of pictures sent in from runners, here. 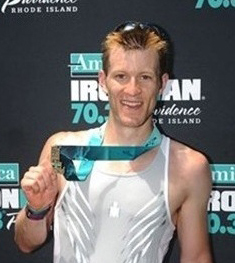 Kurt from Becoming An Ironman is participating in the Jim Calhoun CardioRaiser, which is a benefit for Autism Speaks. To raise awareness and money he has committed to a 6-hours of spinning!!! That's right! 6 hours on the spin bike. Not many people would donate that much effort for charity. His goal is to raise $500 and he's even giving away some raffle items, so if you can, hop on over to his site and give a donation to help this great charity. I'm sure any amount would help. Perhaps forgo the Starbucks tomorrow and donate $5 today? The event is being held on Sunday, February 26th, so time is of the essence. Great job Kurt and I look forward to hearing how the event goes! 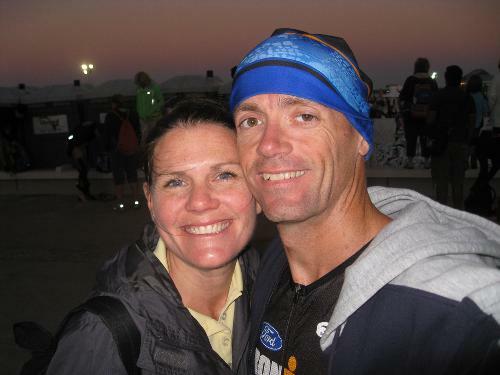 The other day I read about a fellow triathlete, Scott Whitney that was critically injured in a cycling accident two weeks ago from this blog post by Carole Sharpless. It hit me close to home, like it did Carole, about how easily something like this could happen to any one of us or our close friends. Scott will have a very long road to recovery, but is thankfully, showing improvement - including being taken off a ventilator as he is able to breathe on his own. Support from family, friends and loved ones can make a huge difference in someone's recovery and for the morale of the family, so this Valentine's Day, I'm going to ask you to please... go to his Caring Bridge site and write some words of encouragement in his guestbook and let them know that even though they don't know you, you're wishing him the best in his recovery. Thank you and I hope you have a wonderful Valentine's Day!